Number 90 Bar and Kitchen is a spacious bar in Hackney Wick overlooking the canal. The inside is cavernous and industrial with a DJ playing live music and outside is a massive terrace on the water, ideal people watching and boat admiration opportunities. You might also be lucky enough to spot a pirate in a dingy, as I did when I was there. Number 90 has an excellent cocktail menu, which I diligently tried to work my way through for the purpose of this blog. 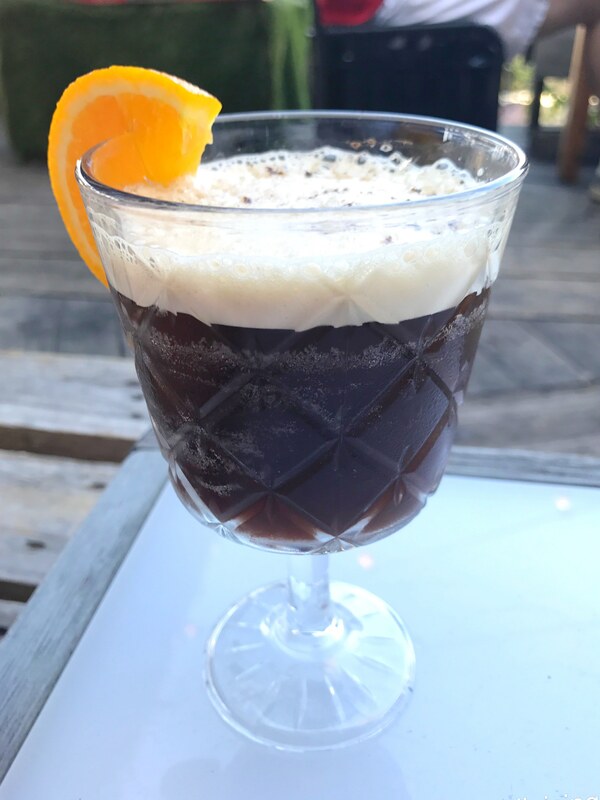 I can highly recommend the N68 Midnight Espresso (Kahlua, bourbon, Frangelico and orange bitters, topped with whipped cream). It’s essentially an elevated espresso martini and it’s so delicious on a hot day to sharpen you up after a few beers. 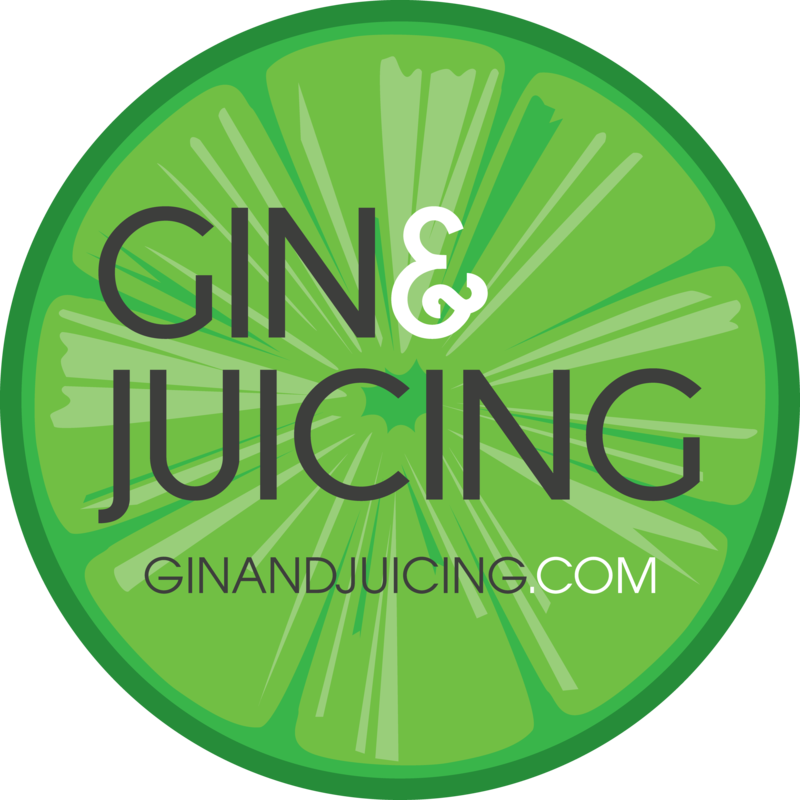 The N90 Ways to Happiness (rum, mango juice, angostura bitters topped with ginger ale) is very summery and tropical. 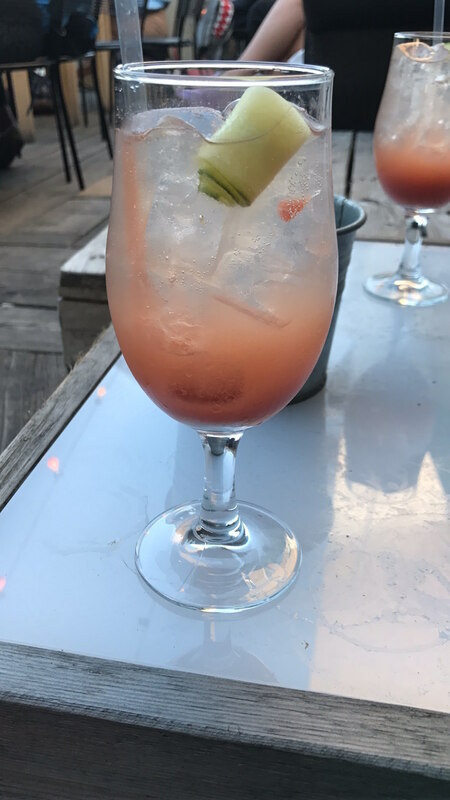 And the N11 Garden Spritz (strawberry, cucumber, Boxer gin, soda and Prosecco) goes down way too easily, which is excellent and dangerous at the same time. The menu looks great though I was too busy drinking to get eating, luckily my friends were much more sensible and lined their stomachs. There’s a highly Instagrammable beef burger with an activated charcoal bun to satisfy your inner goth. Mr G&J had the pulled pork burger, which was packed with oozy, saucy pork and he was delighted with his choice. 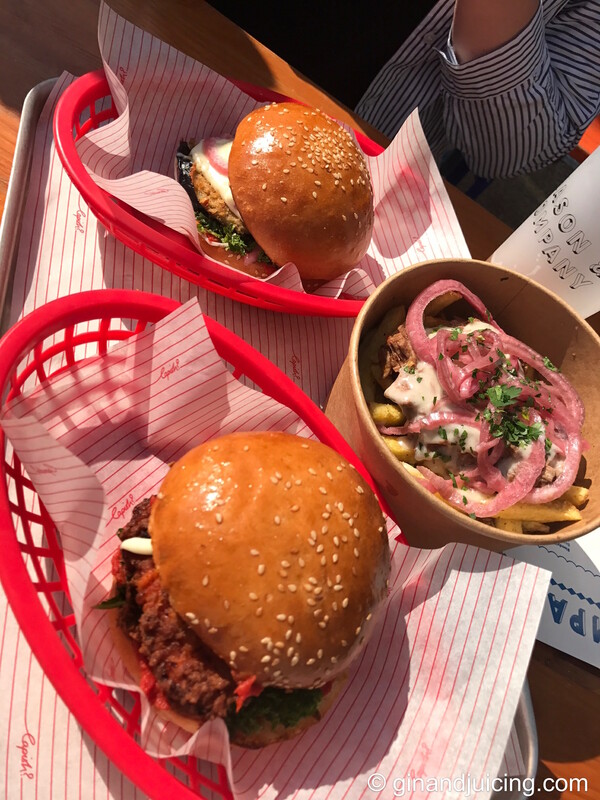 Another friend had the chicken burger, which featured nice crispy chicken and some chorizo for a unique twist. You’ll find Mason & Company down and the new Here East complex facing the canal in a short strip of restaurants and bars. Mason & Company specialise in independent craft beers from all over the world, both on tap and served by the can or bottle. Inside there’s family-style bench seating or if you prefer, there’s a decent sized outdoor area to enjoy your beer in the sunshine. The food is by resident kitchen gangsters Capish? who turn out excellent Italian-American food. 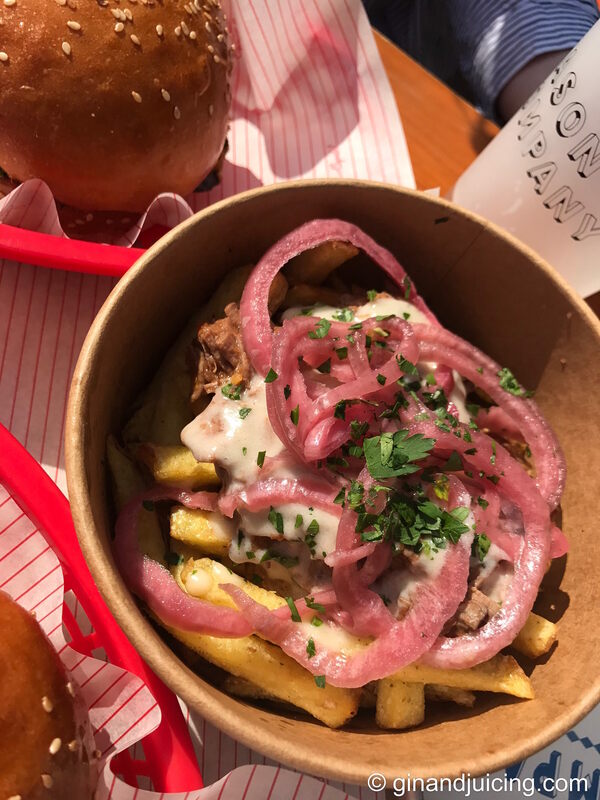 Try the Italian Poutine, which is smothered in 6-hour beef shin which is so achingly tender that you’ll sell your house to fund your new Italian Poutine addiction. 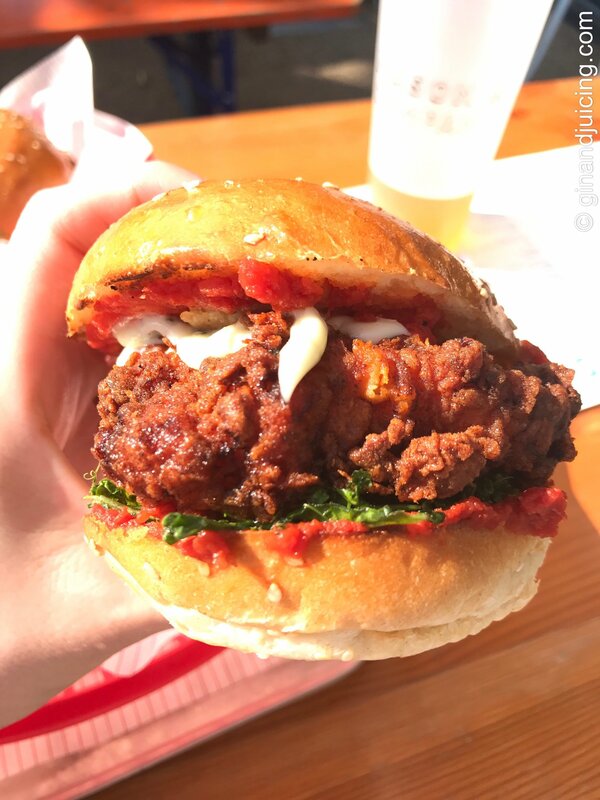 Leave room for the Fried Chicken Parm Sandwich, the chicken is so moist and so crunchy you think that life can’t get any better, but then, BAM! There’s a Parmesan crisp in the sandwich! Oh Umami, you are heaven. And there’s a vast array of beers to work your way through, over 20 on tap. I would recommend getting your beer in a plastic cup (not a flimsy one, a proper hard plastic one) and go sit on the grass with your friends in the sun (or in a deckchair if you’re lucky enough to snag one). There’s heaps of room and it’s a great place to spend more than a few hours on the weekend. Situated right on the corner of Queen’s Yard, Howling Hops is a ‘tank bar’, the first of its kind in the UK. Howling Hops serves 10 different types of on-site brewed beers behind one very long bar. The building is a converted Victorian warehouse with plenty of rooms to sit inside if it decides to rain. Outside there is a slightly small seating area with long tables and benches against a wall, however that does not put off the dedicated fans of this pub, who flock to the area every weekend to sample its hoppy delights. Depending on when you go, you might find chocolate stout being poured, or IPA or some delicious pale ale. Try any and all of them is my advice, I’ve never had a bad beer there. And the food, in case you’re hungry? You’re in for a treat, Billy Smokes are in residence in the kitchen and churning out some of the finest BBQ sandwiches I’ve had. 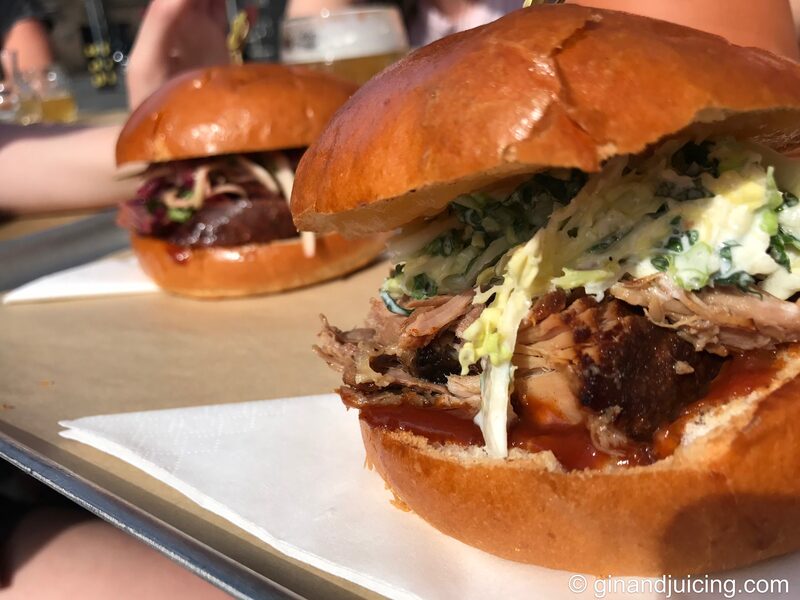 The Smoked Beef Melt is excellent, with oozy melting cheese and served in a brioche bun, as is the unctuous Pork Sandwich with crunchy slaw. Go there, drink beer and have fun. What are your top places for drinking in the sun in East London? Let me know in the comments below, I’m always keen to check out a new recommendation!